Leigh's Fiber Journal: SSC: Bands Done At Last! At long last I can report progress on my Shetland Sampler Cardigan. The front and neck bands are finally finished! The neck band was a breeze, but the front bands were a booger-bear to knit. Each side had to be done twice. I started with the button side, and used the same circular needle I used for the bottom ribbing, a size US0. This is two sizes smaller than I used for the body of the sweater. I was careful to check both my stitch and row gauges, so that I could adjust the number of stitches I needed to pick up along each front edge. This is where I ran into my first problem. According to my calculations, I needed to pick up two stitches for every three rows, which I did. After knitting for awhile, something didn't seem right, so I transferred the stitches onto a string. Sure enough, the band was tight and pulled the entire front edge of the sweater into one big pucker. The second time, I picked up one stitch per row, which seemed to work perfectly with the K2P2 rib I'm using. That was re-knit #1. Re-knit number #2 was the buttonhole side. When I bought the buttons, I arbitrarily figured on five, so I bought six buttons, in order to have one extra. However, once the buttonholes were in, I realized that the distance between buttons was too great. I should have planned on at least seven. Unfortunately, I bought the buttons out of state! So I pulled the five buttonholes out and put in six the second time. I used Nancy Wiseman's revised one row buttonhole (pages 114 - 117 in her The Knitter's Book of Finishing Techniques.) I was going to say that they turned out fair to middlin', but the one in the photo on the left appears to be almost of invisible, so maybe they aren't too bad after all. Next is attaching the sleeves and knitting the cuffs. I'm delighted to think that I'll be finished and able to wear it before winter is gone. I feel for you with the whole button band thing. I once let a cardigan languish for 4 years in a closet because I tried the button bands a few times, couldn't get them to work, and got utterly fed up. 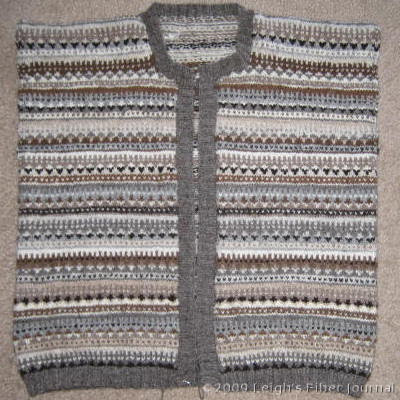 Winter's theoretically approaching an end, and my big sweater project (for my husband) is also approaching its end. I should follow through and finish it up so he can wear it before spring! Wow, sweater is looking great!!! Can't wait to see it finished. Fantastic! You did an beautiful job! Can't wait to see it with the sleeves and cuffs. It's so pretty! Love all the sheepy colors. It looks absolutely beautiful. What a thrill when you finally get to wear it! That whole business of picking up stitches for buttonbands drives me crazy -- every other row, every row, 2 for 3 -- there's never an easy answer. The cardigan is looking great. I look forward to seeing the next stage. Everything about the sweater is looking fantastic! I could never do that as I would have given up by now! Wow Leigh, it is looking SO great! ...what is that thing they say about all good things? I just love those colors, the sweater is really beautiful!